Our Website doesn't currently offer testimonials from customers, although we certainly have received many over the years. The Gallery on the site does share images provided by customers that features the drapery hardware offered through our online store, with the hopes is offers inspiration and clarifies installation options for those who may be shopping on the site. Moving forward, we will also begin to share customer feedback through this blog as well. That being said, our first "testimonial" entry is offered by LJ, a Fibre Artist from Frankenmuth, MI. She needed a curved track to install a shower curtain, and her comments and images are shared below. "I thought perhaps you’d like to see what I’ve done with your flexible dual rail system. 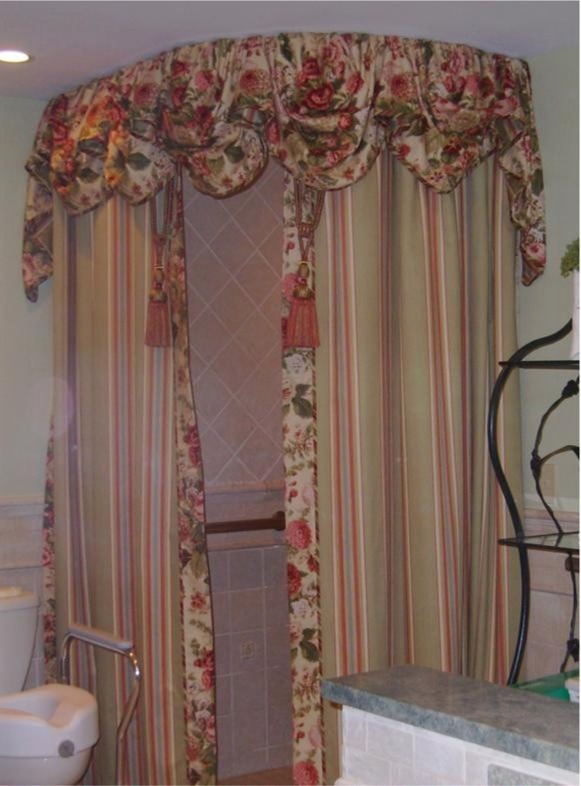 The protective shower curtains are behind the decorative panels. All function as designed. The valance is attached with Velcro on a three inch curved ceiling drop. I am extremely pleased and impressed with your product. I’m proud to have used such a well made product. Your product made me an artistic genius in the eyes of my customer. Form does follow function!!!!!!!! Service was excellent, as well. I can’t wait to use your product in more installations. Thank you!" This particular project highlights that ceiling mounted curtain tracks can provide both function and fashion. 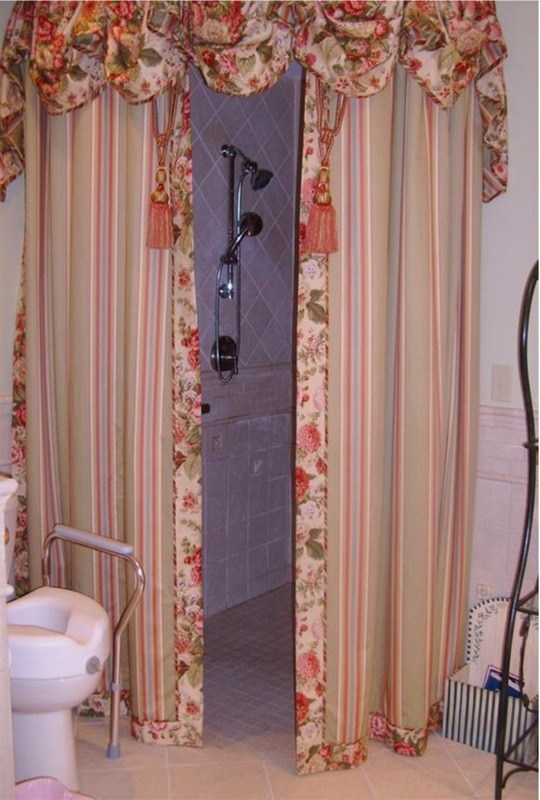 Because this is a handicap accessible shower, the use of curtains with no floor lip allows access to the entire shower opening to a user with limited mobility or needing wheel chair access. This design requirement certainly didn't detract from the decorative appearance of the bathroom. LJ chose the 6100 flexible curtain track for this project due to her need for a track that could be bent to follow the rounded exterior of this shower. 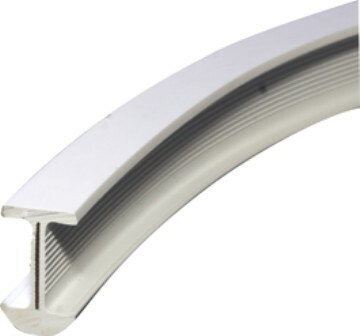 This track is easily installed to form bends or arcs as shown above. Once the 6151 ceiling cartridges are mounted to the ceiling, the track snaps into place to follow the layout required. No pre-bending is necessary, thus eliminating significant expense usually associated with custom bent shower curtain tracks or rods. This track system offers the user a lot of "flexibility" in their design. Curved tracks are no problem with this type curtain hardware. If you need advice on selecting the right drapery hardware solution for your project, remember we are always eager to help. We also offer a sincere thank you to LJ for sharing her project, and hope to post your project on our blog soon as well.